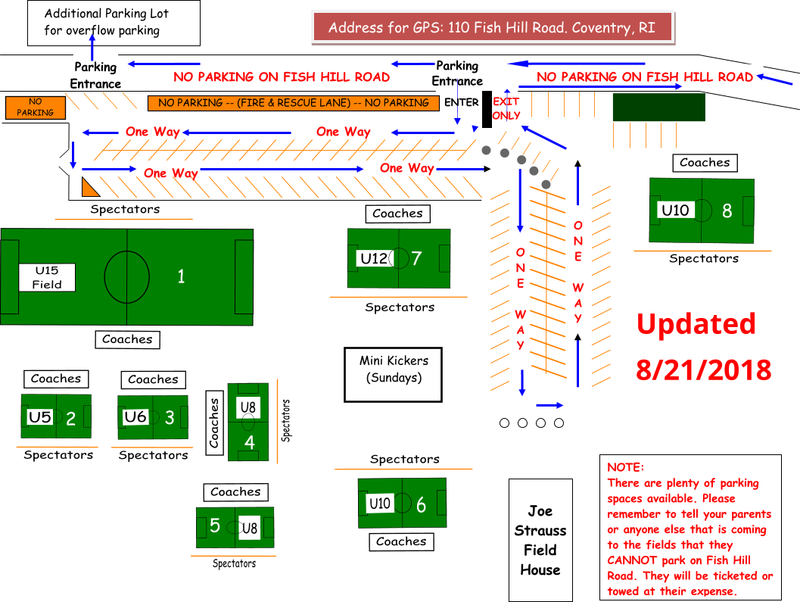 Please review the Field Layout for the Fish Hill Soccer Complex for the 2015 Fall Developmental Season. As much as we DO NOT want to see any fire or rescue vehicles (sorry guys), we MUST keep a lane clear for the vehicles to enter the complex. You can help by ONLY parking in the designated parking areas (inside the orange lines). If the main parking lot is FULL we have an additional parking lot across from the main complex just past the main entrance and on the right (See diagram below). VERY IMPORTANT: As soon as you enter the Coventry Soccer Complex Parking Lot, there is NO PARKING in the right hand lane. That area MUST to be kept clear for Fire & Rescue. Thank You in advance for your Cooperation!! !